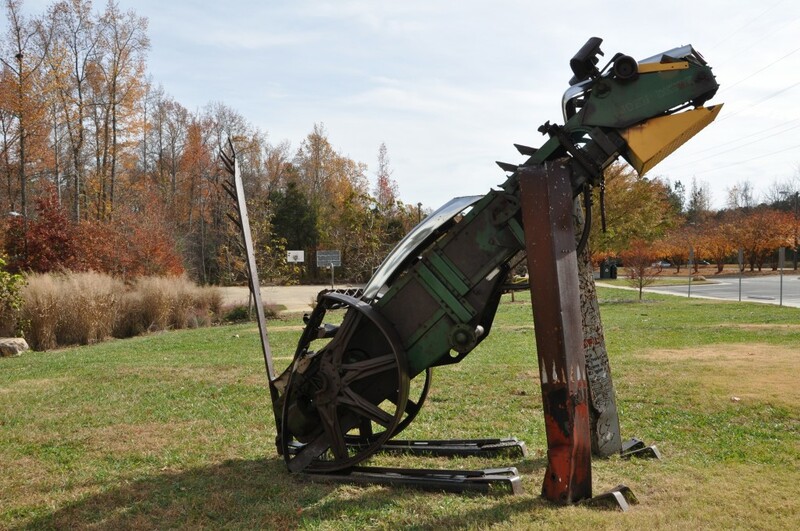 The Chapel Hill Public Arts Commission has installed an unusual “greeter” at the Homestead Road community pool. Henry the dog is a whimsical, interesting and structurally curious assemblage of old metal crafted by Georgia artist Doug Makemson. Henry graciously welcomes pool attendees each day, rain or shine. Kudos go to the Art Selection Committee for finding a sculpture that happily welcomes all ages to this town facility. Peter Nesbit, Chief Curator of the Ackland Museum hosted a presentation Sunday afternoon at Hanes Auditorium, a panel discussion entitled: “Collecting our Thoughts” . The discussion was an enrichment learning experience for the current exhibit at the Ackland titled: ” Carolina Collects: 150 Years of Collecting Modern and Contemporary Art”. Three distinguished panelist presented their experiences of living with art from their career and aesthetic view points. Robert Hobbs is a professor at Virginia Commonwealth University he suggests that post-modernism is an art form that has a domineering conceptual element. He explained that in post-modernism ” interpretation is a creative force and the interpretation is as important as making the art”. As a result, a collector of such art is looking to be challenged by the art work. The art work is taking the collector out of his comfort zone and into a state of exploration. The second panelist, Jeff Whetstone is a UNC photography professor and a successful contemporary photographer. His works are widely collected and exhibited. Jeff states that as an artist, he hopes he is always in a formative stage, so that his work remains new and inquisitive. From the collectors’ perspective, he addressed issues of creating art for oneself versus for the market. This is an age old conflict. While the artist delights in his works being purchased , he does not want his work to take on a direction that constricts creativity anticipating the marketability of his expression. The third panelist was Claire Schneider, an independent curator. She explained that new mediums of contemporary art are often so enormous, and so costly that collectors are devising new methods of collecting. Often several museums will buy one piece and share the cost of storage and opportunities to display. On the opposite end of the collecting spectrum, she introduced novel ways young collectors are entering into the art market with modest budgets. A new concept modeled after Community Sustainable Farming (CSF) has been initiated in a few cities. The new term CSA…Community Sustainable ART has been hatched. Claire gave the example of a town in Minnesota where art supporters pay $300 for the year and receive 5 works of original art. Certainly an interesting concept. This then brings me to our own community where the opportunity to collect original art is easily accessible. Orange County is holding its Annual Open Studio Tour November 5-6, 12-13. Catham County Studio Tour is December 3-4, 10-11. These tours allow collectors to meet the artists in their studio environments. A marvelous chance for we North Carolinians to continue the tradition of CAROLINA COLLECTS!